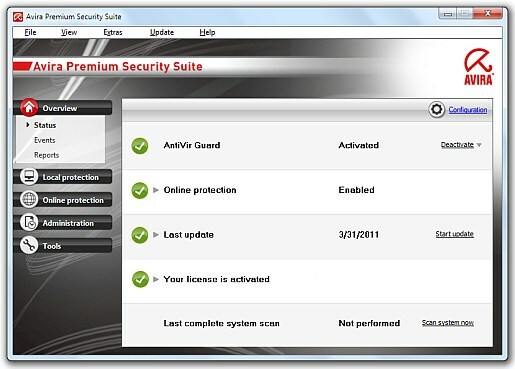 Avira has announced that it is giving away 6 months free of their venerable security suite (the most feature rich offering). I will include the instructions in the installation area. 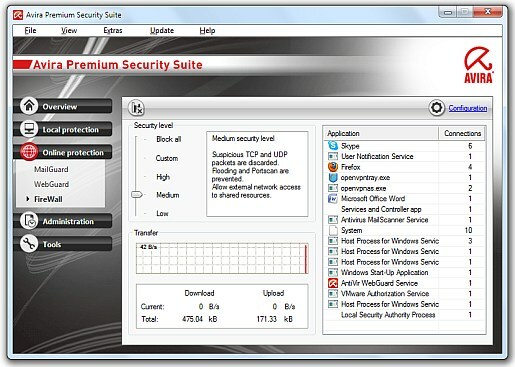 As far as the suite goes, it offers a firewall, anti-rootkit, anti-bot, and antispyware in addition to the award winning antivirus engine. The program has av-comparatives highest rating of advanced plus and the coveted VB100 award. The software also includes a full rescue system, game mode, and even netbook support. To get the six months free subscription head over to the Avira site from the above link 1. Download the german installer and click next until one arrives at the “Willkommen bei…” screen. There click the “Produkt testen” and enter a valid email address. Then hit next and do not continue to hit next (exit the installer). Click the link from an email and get the hbedv.key from the website. Next, install the English version (link 2) and on the license wizard page click, hbedv.key and select the file location. The installation then went smoothly after key was entered. The download was approximately 70 megabytes in size with the initial installer needing to download the setup file. A restart was required to get the program to fully function. 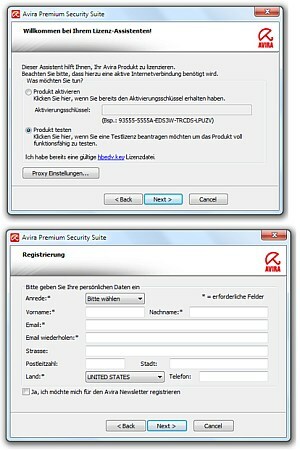 Avira Premium Security Suite offers 10 different scanning modes. The complete system, scan for rootkits and active malware, quick system, and windows system scan etc. The scanner scans at approximately 6 to 8 megabytes per second which is about the same as the benchmark free antivirus. I did have one issue with the real time scanner. I got the virus Win32/Alueron on the test system which is a boot sector virus. While Avira detected the virus in the boot sector, it could not clean it (Avira’s boot sector cleaning tool failed too). 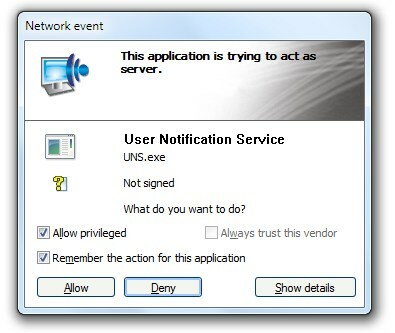 I also got this virus when the real time scanning engine was active (had updated definitions for the virus). I had to reinstall Windows as a result. However, one unique thing to the program is how it selects files extension. There is the smart extension option in which the program uses artificial intelligence to first examine the contents of the file and then decide if it should be scanned. This is different than most antivirus which rely on a predetermined list of file extensions and therefore have major vulnerabilities from a safe extension starting an illicit and obscure one. The firewall is still generally the same as the previous versions. Even though I was on the medium setting (second to lowest), I was still prompted for basic trusted application access. Avira needs to implement a system similar to competitors like Norton Insight and Panda Collective to identify trusted application via the cloud. Rules are segmented into application and adapter (ports and IP address). It doesn’t seem that the Trusted Vendors list has been updated for several years. In addition to the firewall, there is a web protection which is fairly advanced. In addition to scanning active Url's, it also scans all Url's embedded within a page. The scanner is also hardcoded into the antivirus rather than just a browser toolbar so that it adds protection to any browser. The parental controls utilize the Windows account and allow one to set an adult, child, or young person role for each account. There is also a backup option to save modified files on a system from potential deletion. Resource usage is usually Avira’s strong point and that’s no exception with the Premium Security Suite. While idle, the software uses approximately 30 megabytes. When scanning, the avscan.exe process expands to 80 or 90 from 24 megabytes (110 total) and uses approximately 14 percent CPU power. The Suite’s system performance impact is basically not noticeable. As far as things to improve, the main complaint is the limited use of the cloud. The program must quickly add this functionality or it will be become outdated. Also even though version 10 was released in March 2011, the interface still remains the same. The settings area and customization options are also few and far in-between and need to be improved. All Trademarks are property of their respected owners. Please contact us with any concerns. Review content is property of free antivrus help.